Vancouver hometown band Marianas Trench released their new album Phantoms on March 1. 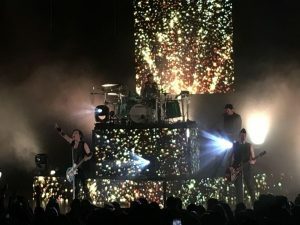 As part of their Suspending Gravity Tour, they played at the Orpheum Theatre on March 29. The pop rock band consists of Josh Ramsay (lead vocalist, rhythm guitarist, pianist, songwriter, and occasional drummer), Matt Webb (lead guitarist and backing vocalist), Mike Ayley (bass guitarist and backing vocalist), and Ian Casselman (drummer, percussionist, and backing vocalist). It’s important to mention that, all of them being singers, they create magnificent harmonies throughout every song, which is a Marianas Trench staple. I’d never been to a show at the Orpheum before, so walking into the extravagant theatre was shocking. Marianas Trench’s new album called for a masquerade theme, so in the foyer there were some people dressed in full prom dresses taking pictures in their masks. There are also many concession stands strewn throughout the venue, which is unlike any Vancouver venue I’d been to—suffice to say, if you have an opportunity to visit the Orpheum you should do so (Ramsey also mentioned that it’s his favourite Vancouver venue)! The openers—Elijah Woods x Jamie Fine—were phenomenal. For an opening act, they got the crowd on their feet in record time. If I’d come to the concert just for this duo, it would have been money well spent. Fine’s voice is unique and conveys power and emotion like few artists out there right now. “Ain’t Easy” from their album 8:47 has intense vocals and a groovy dance beat, like most of their songs, combining many musical elements to provide a very cool track. Marianas Trench were on next. Their setlist was incredibly long (19 songs) but for a band with such a large discography, this meant nobody left dissatisfied. Ramsey’s powerful vocals and incredibly high notes had me in awe. His live performance is really like no other, especially the musical skill he retains throughout the set all the way to the end. Really, the whole band has notable skill in how they not only play their own instruments amazingly well but also harmonize with each others’ vocals in every song, which is in no way an easy thing to do. They played almost all the songs from Phantoms, along with older iconic tracks such as “Stutter,” “Haven’t Had Enough,” “Desperate Measures,” and so on. With all the energy they put into the show, they took well-deserved and much-needed rests throughout the night. During these interludes, the venue showed videos projected onto the stage that featured spoken word reminiscent of Edgar Allen Poe and the black and white sinister feel of The Blair Witch Project. The band’s YouTube video titled “Phantoms” is just a taste of this ambience. The stage lighting was minimal, but beautiful nonetheless. The energy the band gave off and their musical ability alone made up for anything that they may have lacked. During “Desperate Measures,” Ramsey performed through the aisles of the theatre (running past me though, sadly). Their audience involvement throughout makes you feel the full sense that they are a hometown band. I won’t go into too much detail regarding the performance of each song, but notably their last one, “The Killing Kind,” was something to die for (sorry). The performance included an actor on stage draped in black lace who circled Ramsey on stage as he sang. The song itself has a Masterpiece Theatre vibe with the way it merges other (and older) songs into the one track. The harmonies are astounding, as are the powerful high notes that some female singers can’t even dream of hitting so flawlessly. There are honestly very few performing artists who can put on a live show that rivals their own recorded versions. All in all, Marianas Trench is what I would call a band worthy of the “Hometown Hero” title. It is a shame they’re not as popular as I feel they deserve to be, but in a way, this makes them feel closer and more personal. Nonetheless, they deserve all the positive recognition they can get.